Rating: 5 Shiny new stars – can I go higher? No? Dammit. I didn’t know what to expect when I picked up this book. All I knew was that I HAD to have it. A brand spanking new CoHo book to add to my pile; yessss please!! Let me tell you, I was really surprised; not by the fact that the book is fantastically written, because – hello, it’s Colleen Hoover we’re talking about! I was surprised with how originally breathtaking the plot was. This is a book about two unlikely characters coming together in the most unlikely way. This is a book about tragedies and life plans. This is a book about true soul crushing, selfless love. This is a book about human decency. This story was equal parts heartbreaking, and soul mending. Ben was a beautifully crafted character who took my breath away on several occasions, his words were infallible and stunning. Ben was just.. beautiful. I really have no other word for him. Fallon was original and funny, her growth throughout the book is a beautiful thing to witness. Jumping from year to year gave us an ability to have direct comparisons with Fallon before Benton James Kessler, and Fallon after Benton James Kessler. I thought the idea was inspired, original, and fun. On top of that, Colleen could not have fit any more into this book. So much happened; tragedy, heart-break, illness and accidents, births and deaths and the whole flipping shebang! I really don’t want to give away too much detail. Just know that it is crazy good, and had me guessing the whole way through. Did I mention the bookish references yet?! NO? Oh man. I think the bestest most best bit about this book is the bookishness of it. Ben is a writer, I love that. Fallon is a reader, also love that – cause I’m like that. So we see a lot of book talk, which just floats my boat. Because it’s so relatable I find this creates a better connection between myself and the characters. Letting me feel like I am in on an inside joke.. kinda. The characters are funny and well-developed, the settings don’t take away from the story or the characters – thinking about it now, I actually don’t recall a setting description through out the whole book – The side characters are exactly what they needed to be. Colleen even had two of her worlds collide with this book, which makes me irrationally giddy.. my reaction to these things is actually a little worrying. I really, truly, honestly, seriously, can not fault this book. GAH!! The words in this book! Like, ALL of them! I took every single one of them and burnt them into my brain. And I will repeat the process again, and again. The life lessons were endless. So much compassion and love has been embedded on the pages of November 9, I just can’t. No, really, I can’t.. It makes me want to cry from just, overwhelmed everything. November 9 has plopped itself right into my top #3 books read in 2015, and man, it has been a good year for books. But if I had to pick three books to walk away from 2015 with, this would be one, no question. Honestly Colleen, how are you so talented? – Don’t answer that. Just don’t ever stop writing! You are adulting so, so well. 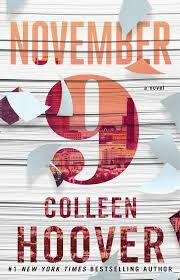 November 9 has taken the cake for CoHo books for me. I loved Ugly Love and Confess, but this book topped them. Miles was always my #1 CoHo man; sorry Miles you have officially been outranked. Benton James Kessler is a beautiful creation. OK so the bookish factor helped, but I found myself highlighting the crap out of these pages. Without a doubt Colleen Hoover can write the crap out of a romance. I seriously loved this story, I could not, could not, could not, get enough.